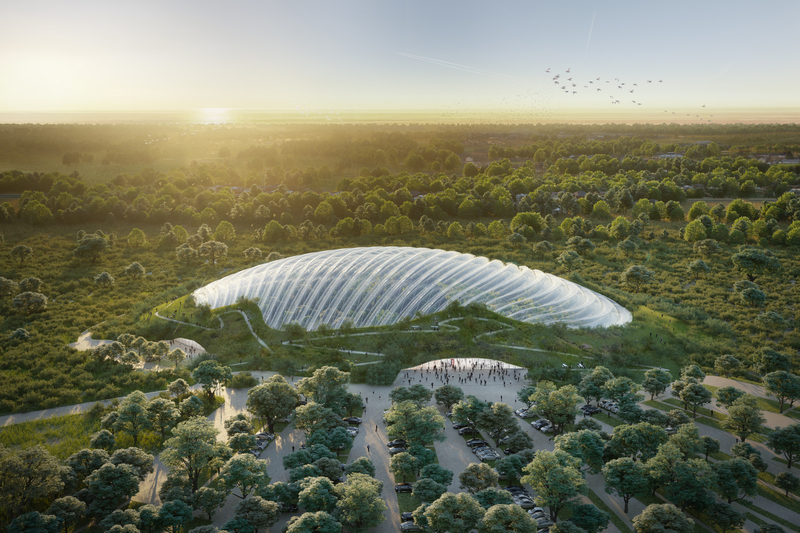 French firm Coldefy & Associates has presented concept project of their design of the world’s largest tropical greenhouse situated under one roof. This project was designed in collaboration with energy company Dalkia. 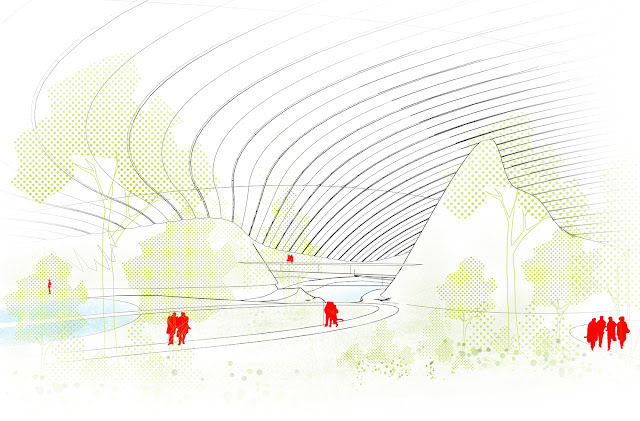 Greenhouse will be situated in Pas-de-Calais, France. It will be called Tropicalia, that will cover an area of 215,000 square feet (20,000 square meters). There will be a tropical forest, turtle beach, a pool for Amazonian fish, and a one-kilometer-long walking trail, where the visitors can walk by an 82-foot-high (25-meter-high) waterfall, 82-foot-long (25-meter-long) “tactile pool” with koi carp, and an Olympic-size pool with Amazonian fish that can grow up to 3 meters in length. It can be seen through an aquarium glass or from the pontoon. It's assumed to be a “harmonious haven” where visitors can enjoy the atmosphere of nature under a single domed roof. Coldefy & Associate programme aims to create a stable 26-degrees-Celsius environment within the greenhouse. To achieve this, the architects adopted a solution to using a combination of structural steel and ETFE plastic technology. The scheme will feature a “double-dome” of 200-foot x 13-foot (60-meter x 4-meter) ETFE strips forming a pressurized “cushion,” allowing UV light to pass through while controlling thermal conditions inside. A third layer of ETFE underneath the structure will accumulate heat generated by the greenhouse effect to be exploited for thermal energy. 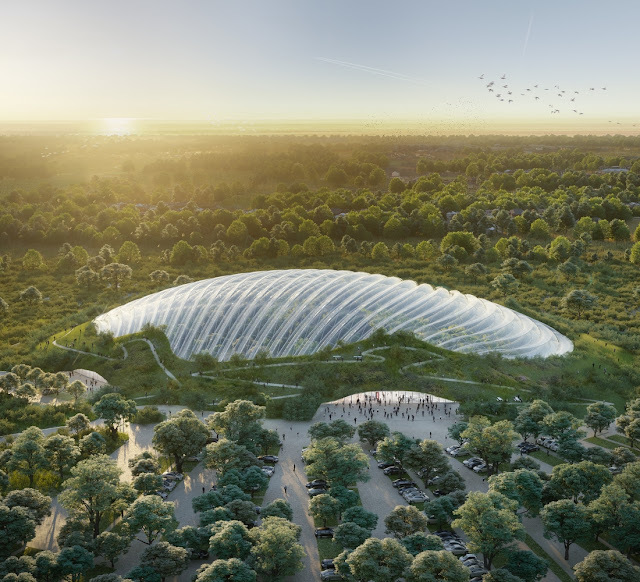 In order to further enhance the scheme’s energy performance, and to integrate the large structure with its natural surroundings, the dome will be partially embedded in the landscape. These measures create an energy-self-sufficient scheme allowing for energy to be redistributed to surrounding buildings. All the favorable conditions for flora and fauna will be created. 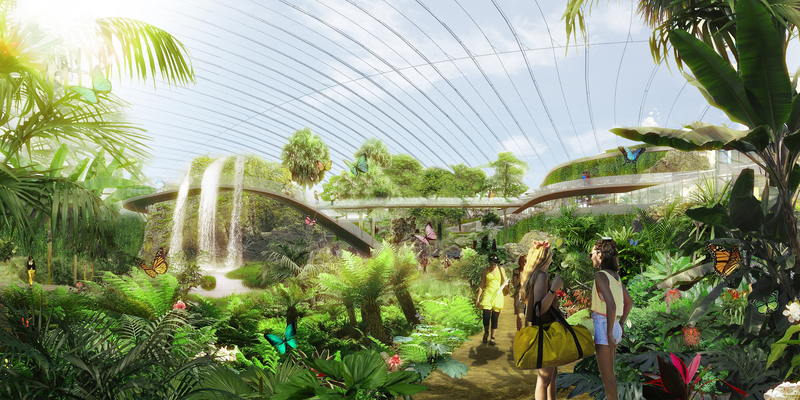 At the opening of Tropicalia, it is planned to attract about 500,000 visitors a year. There will be an auditorium, bar/restaurant, bed and breakfast, and a scientific area dedicated to national and international collaboration, containing a conference room, laboratory, and clinic. 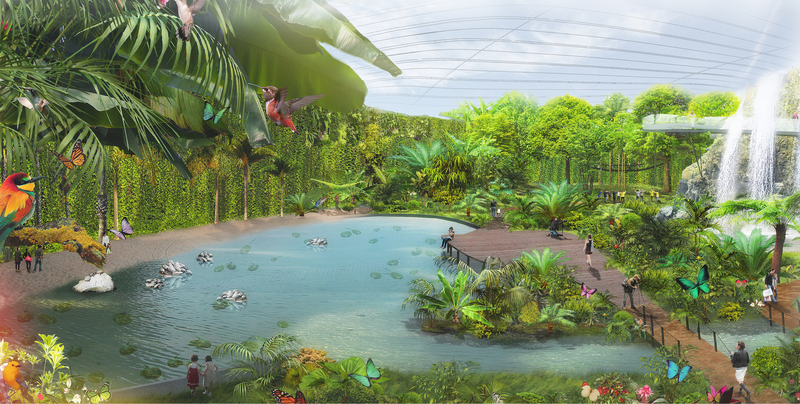 It is expected that construction of Tropicalia will begin in 2019 and scheduled to be opened in 2021. The cost of this project is $62-million.